Director Wei Weng of Velodyne LiDAR’s Asia-Pacific Region called for decisive open innovation as a solution for the future of South Korea’s automotive part market. Velodyne LiDAR is the top company in the world when it comes to LIDAR (Light Detection and Ranging) sensor for self-driving technology and it supplies LIDAR sensors for auto-pilots to Tesla and others. 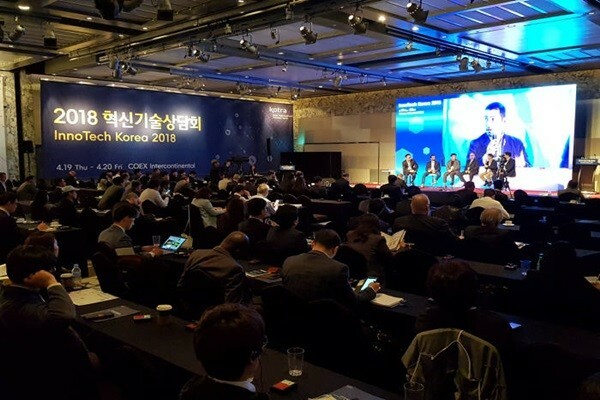 KOTRA (Korea Trade-Investment Promotion Agency, President & CEO Kwon Pyeong-oh) held ‘InnoTech Korea 2018’at Intercontinental Seoul COEX on the 19th. 43 global businesses such as Velodyne LiDAR, Nokia, Faraday Future, Telefonica, Broadcom, and Sprint were in attendance at this conference. Conference is composed of various programs to expand participation in Industry 4.0’s global value chain. About 270 consultations will be held with 120 South Korean small and medium companies and startups over the course of two days. Faraday Future, which is an up-and-coming electric vehicle manufacturer that is seen as a Tesla killer, also sent Tony Nie, who is the co-founder and the vice-president of Faraday Future, to look for business opportunities with South Korean companies. With Executive Director Jung Jae-kyung of SK Innovation as the chairman, insightful discussions regarding means of transportation were carried out at a panel discussion that involved Velodyne LiDAR, Faraday Future, Orange Fab, DRIVE (Israel), and Mando. They shared trends of automotive manufacturers that are investing into car-sharing businesses, changes in business models, and survival strategies of automotive part industries from proliferation of electric vehicles and self-driving cars. Telecommunication businesses such as Sprint and Broadcom from the U.S., Orange from France, Telefonica from Spain, Anatel from Brazil, and Mobifone from Vietnam that represent their respective countries also attended this conference. This indicates that demonstration of 5G technologies and self-driving technologies by KT and SK Telecom during Pyeongchang Winter Olympics were clearly effective in advertisement. Global telecommunication businesses showed huge interests towards companies that have new 5G technologies and promising IoT (Internet of Things) startups that are likely to enter 5G industry. KOTRA is planning to continuously run programs that connect promising startups in South Korea with foreign businesses. Additional events regarding employment will be held on the 20th. 33 startups from South Korea and other countries will hold individual meeting with foreign venture investors to attract investments from them. 11 of these startups will also hold on-site interviews for South Korean university students that are looking for jobs. Employment concert where seniors who succeeded in Silicon Valley as engineers for Google, Airbnb, and Facebook give advises to job seekers is also going to be held.